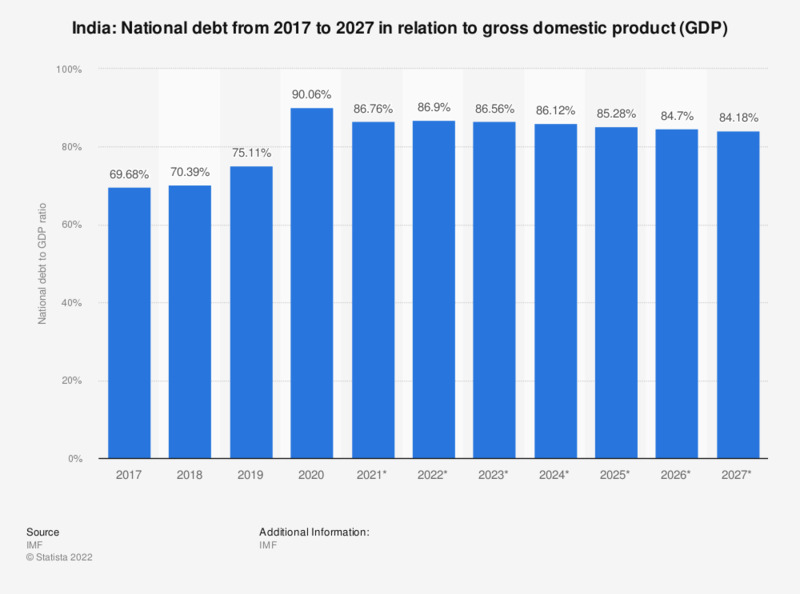 The statistic shows the national debt in India from 2012 to 2018 in relation to gross domestic product (GDP), with projections up until 2022. In 2018, the national debt of India amounted to about 69.55 percent of the gross domestic product. India is one of the most populous countries in the world, and although a large share of inhabitants are living below the poverty line – or probably due to this fact –, the country’s economy is growing steadily. India’s GDP growth is expected to remain steady at more than 7 percent for the next few years, which is almost double that of the global GDP, and both GDP and GDP per capita are expected to increase significantly. Almost half of India’s workforce is employed in the agricultural sector, but services and industry share the other half quite equally. India’s GDP is mostly generated by the services sector, which includes transport, retailing, and offering services in the hospitality and tourism industry. India’s trade balance has been in the red for a decade now, but seems to recover slowly. A trade deficit usually means that a country’s import costs are higher than the amount of money generated with exporting goods. India’s imports could not be compensated for by the country’s exports, as imports have been consistently, even if only slightly, higher over the years both in terms of volume and value. Still, all signs point to India’s economy growing and thriving, reducing India’s debt (as seen above) and unemployment rate, enabling the inhabitants to create a better life for themselves.